I think this heter does not apply in our situation. a. This is not a natural fading over time, but a quick deteriation because of a problem that is affecting the ink, the ink is not fading, it is falling off. 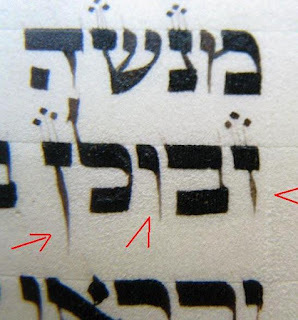 b. I don't think that the Chatam Sofer's heter allows considering the original ink, when there is an obvious shinuy tzura contrasting the bright ink from the faded ink. In regard to the last issue maybe a shaylas tinok would be called for, unless an extreme situation which is obviously a shinuy tzura. Below are examples of old ink fading. 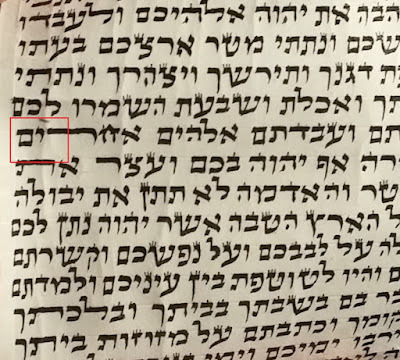 The vav and zayin in zevulun have totaly lost their color - I think they are pasul (they may be fixed in a sefer tora) the nun is on the boundary. I must emphasize: the images given are so delicate, so any variation in size (smaller - condenses the picture) or color, may extremely change the situation. I am giving these images to understand, the issue. These are issues that are very hard to handle through a scan, because of the variations that occur in size/photo color from reality. The caf pshuta is totaly faded and pasul, the others marked are on the boundary. did you see the first example with your own eyes or only on a photo? It might look different looking the actual letter. Flash or other artificial lightening can cause the letter look as it does. Regarding the letters in the second and third pictute, they seem kosher to me (because of what the Chasam Sofer says). 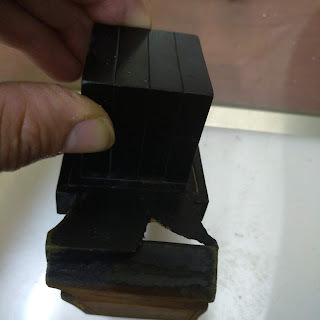 The ink did not fell off, it IS there. Only it did become brownish. 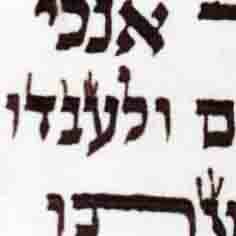 And it is visible only in the narrow letters, because there is less ink. No I didn't see any of these, they are all photos/scans I received. I admit and wrote clearly in the post, these are the most difficult things to decide thru scans because of variations which will occur between the reality and what is seen and change of size. I think in the last pictures some of them are so faded that even after the chatam sofer, they cannot be considered an ois. 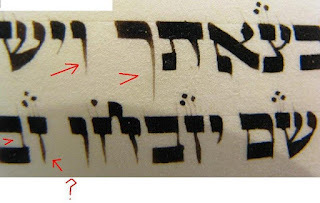 According to the picture I showed R' Shammai along with my explanation of what had happened and how it appeared on the computer he said it's kosher without a shailos tinnok. Since l'maseh there is some dio there with a degree of "blackness" to it from the dio then can be makil. Although difficult to tell from a printed picture and even from here, that's what he told me. I do however know of a lot of Soferim who sell such used Torah's as kosher lechatchila..